Successfully Added Youtube 3D Camcorder to your Shopping Cart. 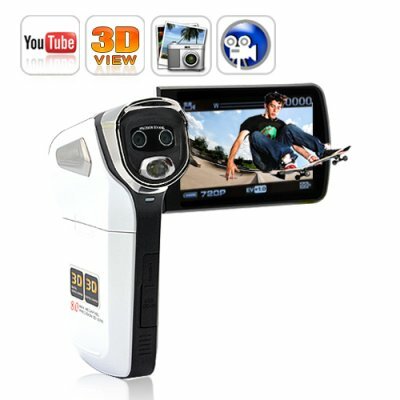 Great all-purpose 3D camcorder for celebrating life events in 3D! Whether you're looking to direct Youtube 3D videos or just want a handy video camera to capture important family moments in three dimensions, The Youtube 3D Camcorder is your perfect solution! Youtube 3D Videos: Youtube, the most popular web destination for online videos. Recently, they have added another great feature to their site - the ability to upload 3D videos! This is great news because most experts agree that 3D online videos are the next stage in Internet Marketing and Promotion. Unlike normal camcorders, the Youtube 3D camcorder uses dual 5 megapixel image sensors which allow it to simultaneously record two nearly identical video streams side by side on one file. When these videos are properly displayed on 3D enabled media software or 3D TV's, the side by side images are superimposed on top of one another to create that stunning 3D effect! Ask yourself: Would I rather watch another boring two dimensional film or would I prefer the excitement of a three dimensional "get in your face" video? If you've ever seen Avatar 3D then we're sure you'll choose three-dimensional every time! The future is 3D video and The Youtube 3D Camcorder offers that perfect balance of price and functionality to parents, teachers, and aspiring Youtube directors. It's so easy: Just press a button and The Youtube 3D Camcorder allows you to choose between 2D or 3D video capture. Then hit the record button like you would any other easy to use camcorder. Everything gets saved to SD card and once you're done filming, transfer the file to your computer and upload the video to Youtube as you would with any other video. The only difference? On the upload page where you would normally leave the TAGS field empty, copy and paste the code between the quotation marks which follow, "yt3d:enable=true". That special instruction informs Youtube that you're uploading a 3D video and that it should be processed differently. Once done, throw on a pair of red and blue 3D glasses and you'll be able to see your uploaded video in captivating 3D! 3D TV Playback: Or after you've done filming, attach The Youtube 3D Camcorder to your 3D TV by means of the included HDMI cable. Hit play on the camcorder, put on the special glasses which come with your 3D TV and you'll be able to put your feet up and watch 3D video on your high definition 3D TV. Instead of watching hit 3D movies like Monsters vs Aliens, you can make your own! Take a look at the photos below for some real in-use shots where we actually tested the Youtube 3D Camcorder on a 60 inch Samsung 3D TV. The results as expected were...spectacular! 3D Viewfinder: Or if you're into keeping things simple, just watch your captured 3D video on the videocamera's viewfinder. The cool thing about watching 3D videos on the viewfinder? You experience 3D excitement without the need to wear 3D glasses! Whether you're a mom or dad who wants to create 3D videos of your child's performance, a teacher that wants to inspire your students, or an artist with dreams of expressing your inner creativity, The Youtube 3D Camcorder is your one step solution for solid 3D videos. Brought to you by the online wholesale digital camera and videocamera specialists - Chinavasion. When using the 3D mode you cannot zoom. Format your SD card when first using the camera by selecting the formatting option in the settings menu. Easily view your HD video on your HDTV by using the included HDMI cable.